Rent a S8E5000 or S8E6000 marquee washing machine on a short or longer term contract to keep your marquees looking as good as new effortlessly. Our S8E5000 and S8E6000 marquee washing machines are available to rent on a short term (one week) to longer term contract, providing you with a flexible alternative to purchasing a machine. We believe that regular washing of your marquees using our machines will keep your marquees looking at their best for longer with minimal effort. 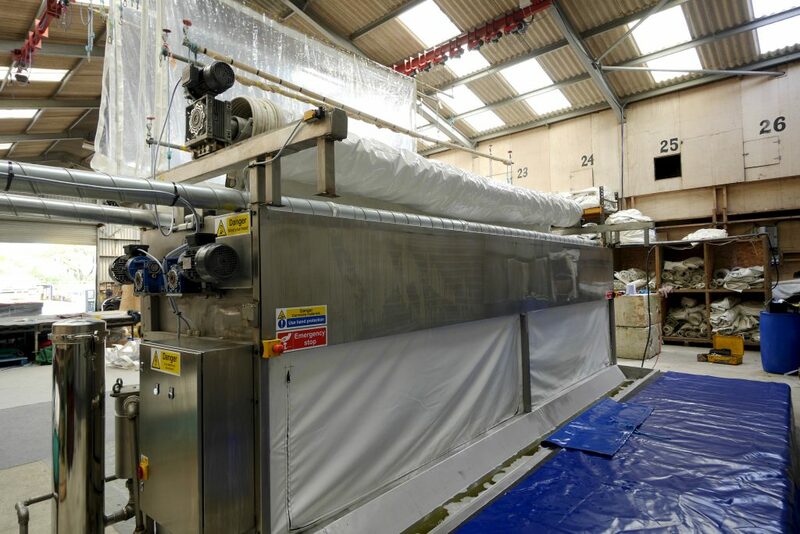 Our washing process with concentrated dip tanks, dual speed washing cycle and new technologically advanced air drying system not only removes dirt and stains, but leaves your marquee sections 100% dry ready to store, or for immediate reuse. Our S8E5000 or S8E6000 marquee washing machine will be delivered to you by one of our highly trained technicians, providing full training and instructions on how to use the machine. Designed to be simple to operate, you will be up and running in no time. Please call us on +44 (0) 203 750 1222 or use our enquiry form to arrange a quote. Straight Eight Engineering delivered today our first S8E5000 to Aussie Marquees in Cornwall. Good Luck Aussie Marquees with your season ahead!